These Bourbon Biscuit Brownies are perfect for days when you have a sudden urge to have brownies, but do not have any ingredients on hand to bake it? Or maybe you want to bake a brownie but do not have the time to follow a super lengthy recipe. If you have ever faced such a situation, then this recipe will come to your rescue. For the 2nd day of my brownie theme Blogging Marathon, I decided to post this quick-fix brownie recipe. With just a handful of ingredients making brownies this way is a breeze. This is cheat's version where bourbon biscuits are used as a vital ingredient – no need for additional flour, sugar, or butter. Looks too good to be true, try the recipe yourself. 2. In a mixer jar, add the broken digestive biscuits, bourbon biscuits and churn it into a powder. 3. Take a large bowl and tip in the biscuit powder, add Bournvita powder, cocoa powder, and stir. Add milk little by little and whisk to get a smooth batter. 4. Add the Eno Salt to the batter and give it a quick stir. Pour the batter into the prepared tin and bake in the preheated oven for 20-25 minutes. 5. When baked, insert a skewer in the middle to see it comes out clean. 6. Take it out of the oven and let it cool down for 10 minutes. You can then lift the brownies out of the pan along with the parchment. 6. Once, the brownie has cooled down to room temperature, slice it into squares and serve with a generous drizzling of chocolate sauce. 1. These brownies are not intensely chocolatey. So, it is best to serve them with a drizzle of chocolate sauce. 2. You can also add 1/2 cup choco chip or chocolate chunks in the batter for an intense chocolate flavour. 3. This recipe should also work with any other chocolate flavoured cream biscuits, like oreo, etc. Instead of digestive biscuits Marie biscuits or Milk Bikies can also be used. Still, want to try making brownies the traditional way – check out some other recipes already posted here. Oh my!! What an innovative bake! When I read the title I thought u placed the biscuits in the batter. This one is super cool!! Once again bookmarking this too! Oh wow! This is amazing... I have some ParleG in my pantry... must make some brownies off it, then! A totally different kind of brownie... amazing. Didn't Eno leave an after taste?? Fantastic recipe , bookmarked instantly . Strange but no one has biscuits in the house , I get them only when my grandkids come in , so I will specially get them to try this version . Too good a recipe . 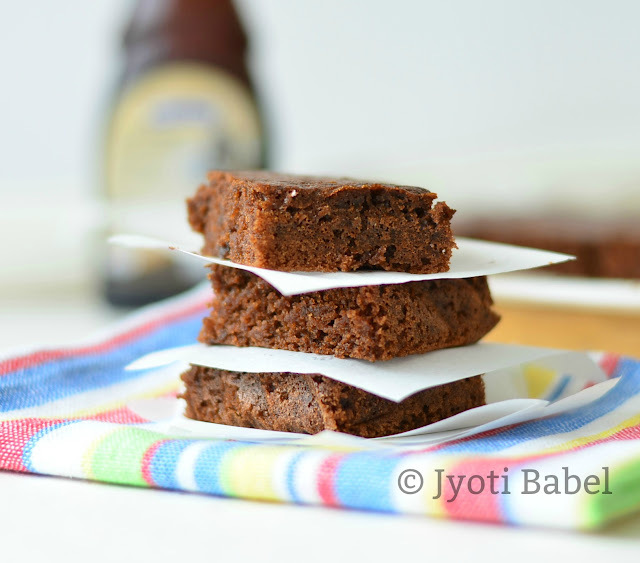 This is simply too good..I loved the texture you got..very nice!..enjoyed the brownie series.. 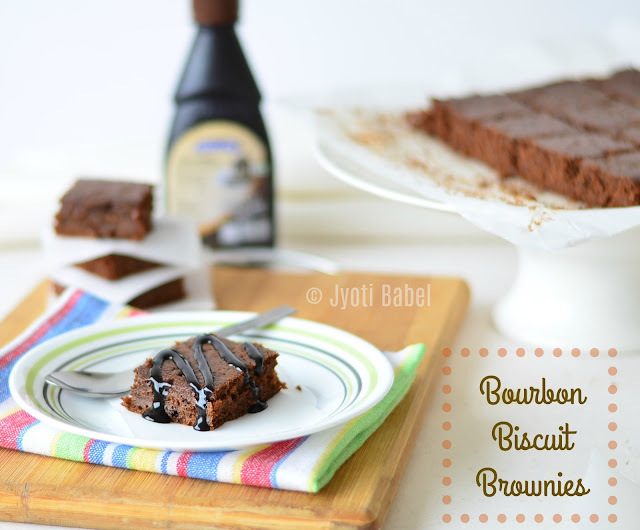 Bourbon biscuit brownie looks so delicious and very innovative too. never heard of bourbon biscuit but I suppose any biscuit can be used - what a great innovative recipe! This is so innovative. Looks amazing. Bookmarked!! wow this is a real quick fix for a dessert! love the texture u have got here! definitely trying this!